The first thing that sprang to mind for this topic for me was this beautiful animal, one of my favourites. Then I remembered I'd done a pencil sketch a long time ago, searched around and found it, and added a little bit of colour in Photoshop. The size and resolution of the pic here aren't as good as I'd like - it was done as a study in a particular pencil texture technique I was trying at the time, as this isn't clear enough to show it properly - I might replace the pic with a larger file later in the week. This is an Eastern quoll, an animal that used to be common across eastern Australia - even to being found in the suburbs of Melbourne into the sixties, but now entirely extinct on the mainland and found only in Tasmania. If foxes become established in Tasmania, that could be the final blow. The related Western (chuditch) and Northern quolls are similarly embattled, as well as their bigger relative, the tiger quoll. Around the time I drew this I was fortunate enough to visit where Northern quolls were being studied at Monash University - they're now in decline largely due to the spread of the cane toad. Amazing illo. Love ur technique and the sweetness of ur work. wow, what a beautiful illustration - it's so realistic! This guy's great! It's too bad you've lost them on the mainland. Damn those Cane Toads! Maybe you should raise some and release them back into the wild around Melbourne? Repopulate! Nice illo, it's cool that you're sharing animals I otherwise would have never known about...not even from my local zoo here in Columbus. At first I thought it was a well-drawn spotted rat but after reading your explanation, I took another look and saw that it has more fur, especially around the tail. nice work, at first i thoght it was field mouse till i read ur note, now i now differently thanks. A quoll, huh? One of the things I love about illustration friday is getting exposed to more styles and takes on the world. Now I am getting familiar with zooology on top of it! This is a beautiful drawing, soft and clean, great line work, the texture really works. I don't think it needs fixing up at all, but that's just me, it's your art! finally-it took me hours befor your comments box was repaired by blogger. i am glad it's not a rat. the softness of the technique makes it look like real. i don't know but the size and resolution looks so fine in my computer, but i guess you know your work better and i'll look forward to see the new larger file if you are going to post it but please i wanted to see the difference so if you won't take away this file-just for comparison. thanks for the info, too. i am beginning to love your animal artworks. beautiful rendering !! GREAT illo! So very cool and thoughtful to share local things with your art-friends! 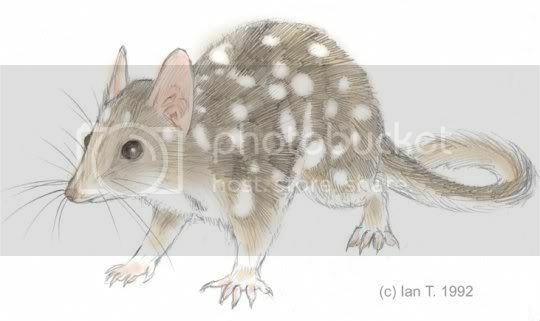 Love the illo, love learning about the Eastern quoll...in fact, I have no quibble with your quoll. This little creature looks so real...I feel like I could reach out and touch it! Its fur and the whiskers look so tactile...just amazing technique, Ian! What a shame it's in decline! How large are they? It looks about mouse or rat size. Hey Ian, I love when you do realistic work, because you're so darn good at it. Wonderful animal!, Americans are totally in awe of all the fabulous animals you have there, and it seldom occurs to us that they might be endangered. It's nice that you gave us some interesting info along with the terrific illo. And a big thanks for the nice posting you left on my blog. Gosh I just love the energy and fun of Lichenstein, and I just wanted to capture some of that feel. Of course the love of it, comes from a total love of comics, which I KNOW you totally understand. Beautiful piece. Love the realisim. What a sweet-looking, wonderful creature! I hope it wins the battle of survival. what a lovely little animal.. beautiful illustration!